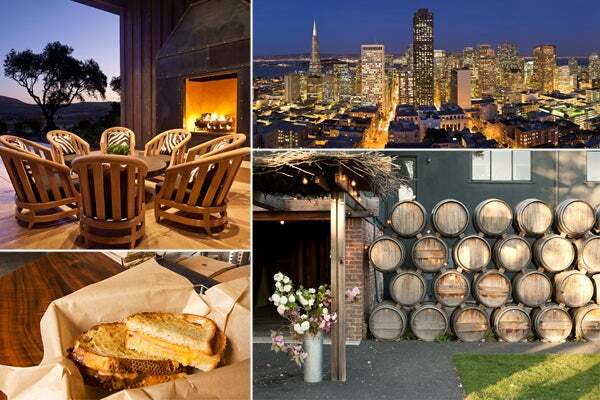 The Ultimate Guide To S.F. : Make Your Visitors Fall In Love, Fast! So, we’re here to guide all you Bay Area guests in a direction that won’t just keep you entertained, but will actually leave you head-over-heels in love with this city. S.F. 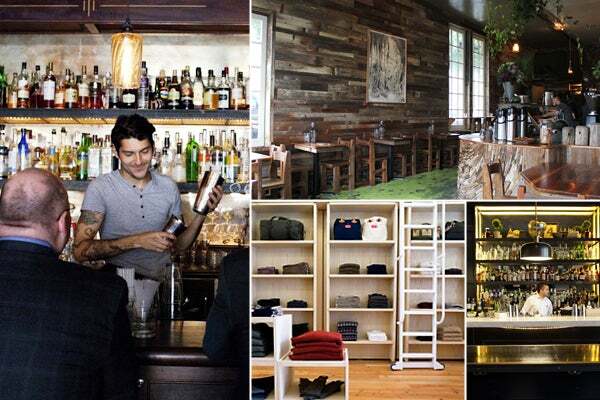 is littered with cool indie shops, innovative eateries, and chill bars (from beer gardens to artisanal wineries to top-notch coffee joints) that pop up practically daily—so, it makes sense we’d want to share the intel. Whether you’re breezing through town as a visitor or have the urge to play tourist in your own city, after following our cheat sheet, you’re so going to understand what Tony Bennett was crooning about. 9:30 a.m.: Walk five blocks to the Civic Center BART station and take it one stop over to 16th Street. Stand in line (it's part of the fun, we swear) at Tartine Bakery and order the sticky bun. 10 a.m.: Walk said sticky bun over to Four Barrel for a French-pressed, made-to-order, ridiculously good cup of java — served by friendly (and cute!) baristas. 11 a.m.: Grab a scoop of Lavender-Honey ice cream at Bi-Rite Creamery (pre-noon cones...that’s how we roll). Soak up the morning rays and people watch at nearby Dolores Park. Noon: Now that you're finished parking it — time to get spendy. The shops are open! Head over to BellJar and Candystore Collective on 16th Street, then walk down Sanchez Street toward the Castro for more rack fondling at Unionmade. 1:30 p.m.: Time to chow down! Fill your belly with organic comfort food at Starbelly. Be sure to nab a seat on the patio. 2:30 p.m.: Hop the F train (vintage streetcar to you) down Market Street to Hayes Valley. 3 p.m.: Happy Hour time! (Hey, you're on vacay, right?) Grab a pint at Biergarten before the communal tables fill up, or if you skipped Bi-Rite be sure to scoop up the tasty treats at Smitten. 4 p.m.: Browse retail besties Reliquary, Acrimony, Dish, Welcome Stranger, Ver Unica, and Gimme Shoes on and around Hayes Street before they close up shop. 6:30 p.m.: Head back to the Mission for a bite at not-to-be-missed Flour + Water (make your reservations ahead of time). It takes Italian fare up several notches and boasts last-meal-worthy pizzas and pastas (the cappellacci with rabbit meatballs had us swooning — until the divine Calabrese pizza showed up). Don't forget to check out the bathroom. 8 p.m.: Pop by Bloodhound for a post-dinner cocktail (Ricky Ricardo for tequila fans), then hit up Dear Mom for more people watching and a cold one (bartenders Casey or Oliver are great for what’s-on-tap recs) or sling back a whiskey by the digital jukebox. 9 p.m.: Bar hop your way back to the 16th Street BART station, and before you head back to the hotel wrap things up with a nightcap with a view at Jones. 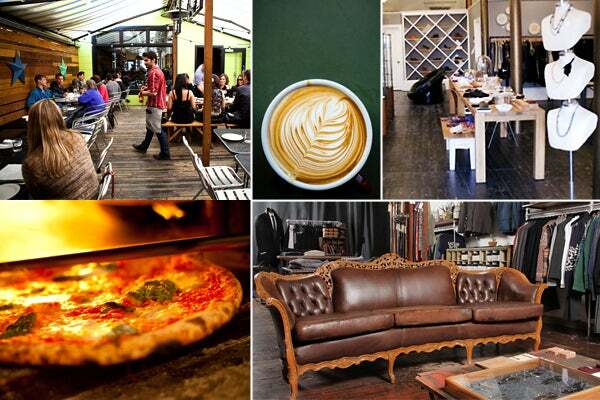 Photos: (Clockwise from left) Via Starbelly, Four Barrel, Candystore Collective, Flour + Water, Welcome Stranger. 9 a.m.: Start Day 2 by catching the 38 Geary (express if you can) to the mouth-watering mecca that is the Ferry Building and get your caffeine fix at locally worshipped Blue Bottle Coffee. (Go ahead and cast your mental vote for the java wars: Four Barrel or Blue Bottle?) Stroll through the corridor of tempting sweet and savory San Francisco treats. 10:30 a.m.: After you are finished food ogling, hop on the N Muni toward Ocean Beach. 11:30 a.m.: Grab a sure-to-be-amazing brunch (the grilled cheese knocks our socks off) at beachy-chic Outerlands. 12:30 p.m.: Stop in General Store for quirky knick-knacks (slingshot, anyone?) and Mollusk Surf Shop for classic, California boards. 2 p.m.: Follow the scenic drive, past the historic Cliff House and toward Lands End — a pretty, flat coastal hike with awe-inspiring views. Hike this. 3 p.m.: On the other end of Lands End, hitch a ride on the California 1 toward Fillmore Street. 3:30 p.m.: Split a Vietnamese sandwich at hip eatery Bun Mee or a snack at Jane Café. Peruse Fillmore Street havens Nest, Erica Tanov, and Steven Alan as you make your way to Broadway Street. Snap the view! 5 p.m.: Walk down the hill to Union Street (do not try this in heels) and hop on the 45 bus. 5:30 p.m.: Get off at Hyde Street and walk over to the famously curvy Lombard Street. Walk and snap plenty of pics! 6 p.m.: Stroll through North Beach, S.F.’s old-meets-new Little Italy. 7:30 p.m.: Park your tired legs at Park Tavern for an upscale seafood dish or, if you want to lay low, Tony’s Pizza Napoletana never disappoints. 9 p.m.: Polish the night off with a libation at Comstock Saloon or a cocktail from the mix masters at 15 Romolo. Photos: (Clockwise from left) Via 15 Romolo, Outerlands, Park Tavern, Steven Alan. 9 a.m.: Begin Day 3 by swinging by Sightglass Coffee and grab your morning brew. Ponder on who is now winning the coffee competition. 9:30 a.m.: Head to The American Grilled Cheese Kitchen for some crazy-good comfort grub. The Farmer's Breakfast is beyond satisfying. Eat it indoors, or bring your meal to the lovely South Park, a few paces away. 10:30 a.m.: Pick up your rental car and get ready to explore the beauty that is the Northern California wine country. 11 a.m.: Drive over the Golden Gate Bridge (look right for a view of Crissy Field, Alcatraz, and the dome of the Palace of Fine Arts) and set your GPS to Scribe Winery. Noon: Arrive at Scribe Winery to taste grin-inducing Pinots and Cabs on the laid-back 200-acre property. Be sure to have fun on the rope swing that looks out over the vines. 2 p.m.: Before you get too boozy, hightail it over to The Fremont Diner for Oyster Po’Boys — or peep the sweet digs of Ram's Gate Winery for wine flights, food, and lounging in the Sonoma sun. 5 p.m.: Wineries close (tear), so start to make your way back over the bridge. 6 p.m.: Drive through the Presidio before dark, past Lucas Films, up the hill, and through the swanky homes of Presidio Heights. Home-envy alert! 7 p.m.: Park your vino-filled tummy at Mission Chinese Food for a budget-friendly feast of thrice-cooked bacon, fried-pork belly, Ma Po Tofu, and salt-cod rice. Seriously, you cannot come to S.F. and skip this place. Just be prepared to wait a little bit (you can always grab a glass at neighboring Commonwealth). 9 p.m.: Say “so long” to San Francisco with an expansive view of the city at old-timey bar Top of the Mark. Or sip on the utterly tasting Ti Punch at Bar Agricole. Um, are you head over heels, yet? We thought so. Photos: (Clockwise from left) Via Ram's Gate Winery, Top Of The Mark, Molly DeCoudreaux, The American Grilled Cheese Kitchen.